Rockpoolers who have visited the south and west shores of Britain will be familiar with this small pentagonal sea star with its green, orange or blue-grey livery. It is locally common on south-west, west and north-west coasts. Asterina gibbosa is found from the lower shore down to 30 metres. It prefers the underside of stones, in fairly exposed locations, where there is some sand and gravel and abundant organic matter on which it feeds. Aquarium study has shown that this animal is also a carrion feeder, quickly homing in on any dead carcass, even another cushion star. Tank reared specimens do not, generally, stay out of sight as they do in the wild. This is due to the light intensity, the animal being highly sensitive to bright sunlight. Low light aquaria are easily tolerated. This species will readily reproduce in an aquarium environment, even in the presence of predators. Usually in late May or early June groups of individuals will be seen clustering together, a sign that egg laying is imminent. This can happen anywhere in the tank and the eggs may even be shed straight into the water. They number up to 1000, have a diameter of 0.5 mm and are usually pale orange. If not consumed they hatch in about 20 days. The parent takes no part in the proceedings once the eggs are laid. Asterina gibbosa is a protandrous hermaphrodite. It matures as a male at about 2 years old before entering the female phase 2 years later at about 20 mm diameter. It lives for up to 7 years. Asterina gibbosa is easily kept, even in small home aquaria where it readily accepts fragments of boiled mussel flesh. Specimens of 25-30 mm tend to survive better than juveniles, which may be attacked by wrasse or crabs. A word of warning: even in aquaria the hatching rate of Asterina gibbosa eggs can be quite high, your tank could be overrun with tiny starlets! NB: This latter event has been confirmed by other aquarists on several occasions. This species was only formally identified in 1979, by marine biologists R. H. Emson and R. G. Crump during studies of Asterina gibbosa at West Angle Bay, the beach in Pembrokeshire that was so badly covered in oil from the Sea Empress from the first and subsequent slicks that escaped from the grounded tanker. The two species are superficially similar and distinguishing one from the other can be extremely difficult. However, despite almost always being found on the same shore as Asterina gibbosa, this second species only exists in a green form. Fine if all the resident Asterina gibbosa are orange, but mix in the green variety and you can imagine the problem. It is only by studying the animal at length that the main differences will appear. Asterina phylactica is more likely to be found on the edges and tops of stones than its near relative, suggesting a much greater tolerance of bright light. It is also commonly found on clumps of seaweed. With a much narrower range on the shore and a more restricted geographical and bathymetric distribution, Asterina phylactica is probably not as resilient as its larger relative. 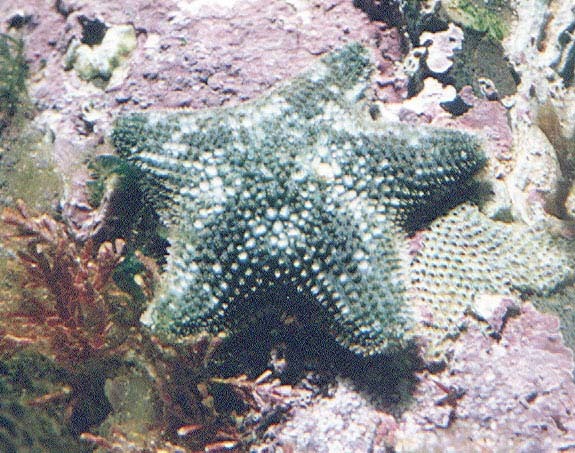 This is also shows in its coloration which is a pale green with a darker five-pointed star extended down each arm (see illustration). These markings are highly cryptic and help to break up up the shape of the animal, particularly against an algal background, suggesting a need for concealment. It has also been noticed that Asterina gibbosa will attack and eat its smaller (15 mm diameter max.) counterpart, which also has a shorter lifespan of up to 4 years and a higher mortality rate (from aquarium studies). Asterina phylactica will also reproduce in aquaria and this is where the biggest difference between the two species can be seen. This echinoderm is a simultaneous hermaphrodite (male gonads and mature eggs occurring together). It lays identical, but, fewer (100+) and more viable eggs than Asterina gibbosa. The eggs once laid are brooded by the parent which hunches over them until they hatch. This has occurred in the last two summers in my aquarium, but the survival rate of the juveniles appears to be much less than that of Asterina gibbosa. The animal matures sexually at about 5 mm diameter. In aquaria, Asterina phylactica will readily take fragments of boiled mussel flesh and is typically an omnivorous scavenger. It seems prone to attack, particularly from blennies, perhaps due to its small size. Occasionally, it may fall prey to the larger Asterina gibbosa. A. phylactica has lower sensitivity to light than A. gibbosa and can endure up to 100000 lux in summer. A. gibbosa will hide away when the light exceeds 50000 lux in summer, which can be expected on a bright summer's day at the latitude of south Wales. This restricts the parts of the shore the Common Cushion Star can live in on, and it will be replaced by A. phylactica in high shore pools. This will have a significance at more southerly altitudes, where the light levels on the lower shore may exceed 50000 lux. Both species have been reported from the Mediterranean. Because West Angle Bay was in close proximity to the spill and because of its north eastern facing position at the entrance to Milford Haven it received several thousand tonnes of oil washed up in the first week. The high spring tides deposited the oil all over the beach up to the high tide mark. In the four weeks from 15 February 1996, most of the oil was removed from the bay by a team of human workers and the sandy beach is now clean. There remains a few patches of heavy fuel oil on the rocks and in pockets of pebbles. The West Angle Bay limpet mortality ranges from 50% in the protected parts of the bay to 95% on the outer rocks. The rare cushion star Asterina phylactica fared particularly badly because it lived under stones and in pools near the high water mark which received large amounts of oil. A two day intensive search revealed a 90% mortality with only 11 survivors out of a population of an original population of only 150 starfish. Asterina gibbosa, occupying the pools lower down the shore, fared better with a good survival of adults above 15 mm in diameter, but there was heavy mortality amongst the juveniles. An estimated 200-300 survived the initial impact of the oiling. The consequences of the high limpet mortality were quickly observed. On the grey sloping rocks that were previously kept clear of seaweed by the grazing activities of the limpets, a green carpet of the seaweed Enteromorpha became established by June. This is one of the subtler changes that could be observed. Detailed studies are being undertaken to monitor the ecological succession and fauna alterations. On this and other shores the lichens in the splash zone have been killed and removed as a covering from the rocks. Thanks for replying I do not have any further information from West Angle Bay I was only there for a biological field trip. However when I was there I did not see any evidence of oil. We did find a few starfish but we did not classify them. Glad to hear about your Snakeslock I read somewhere that they fight for territory is this true and what happens in your tank. If you ever find any further specific information on the Web. Then please e-mail the addresses of the website to me. protandrous | prtandrs | a. L19. [f. PROTO- + -ANDROUS. Cf. PROTERANDROUS.] Bot. & Zool. Of a hermaphrodite flower or animal: in which the male reproductive organs come to maturity before the female. Opp. PROTOGYNOUS.protandric a. = PROTANDROUS L19. protandry n. the condition of being protandrous L19. I finally tracked down one of my favourite seashore species - the tiny cushion star Asterina phylactica, only described in 1979. Six of us counted 65 in 2 minutes. Look closely and you can see 2 adults and at least 5 babies in the photo, as this species broods the young. Top find! — with porcupine marine natural history society.